Zero Waste is: Reducing and recycling as much as possible, treating waste as a resource. Zero Waste Communities are: Well-informed, well serviced communities, involved in their own waste management. A steering group was formed, including Monmouthshire Community Recycling (MCR), Monmouthshire County Council (MCC), Communities First, St Arvans Community Council, Rural Community Action and Homemakers (Furniture Recyclers). Hiring a Zero Waste Coordinator ( supported by Environment Wales with funding from the Welsh Assembly Government) in late 2006 the zero waste plan was created. The target area of St Arvans (a village 2 miles north of Chepstow, with 273 households) was chosen as Monmouthshire’s Zero Waste Village. Gathering baseline data on participation rates, diversion rates and residents attitudes towards recycling and waste management encompassed Phase 1. 85% of residents used the standard Black Box kerbside recycling scheme (collecting Paper, Glass, Cans and Textiles), food waste and green waste collecctions on a regular basis before the project started. To move towards zero waste the materials recycled, and the percentage of residents using the scheme would need to increase. Plastic bottles were the first additional material to the service, followed shortly by other rigid plastic and paper drinks cartons (Tetra Paks). Monitoring the participation rates constantly, these additional materials, synergistically with door to door canvassing, increased participation rates to 95%. The Zero Waste Village Project was launched, in June 2007, with a celebration of waste reduction and recycling which also saw St Arvans’ first zero waste week. This challenged residents to not produce any residual waste, and report back findings to MCR. Since the launch and addition of more materials, many St Arvans residents have reported only putting their refuse sacks out on an alternate weekly cycle. This is without any enforcement, only encouragement was needed for the refuse service to be used on an alternate weekly collection. Residents were asked what other materials could be recycled or composted, suggestions included plastic carrier bags, batteries, ash from open fires, etc. A visit by Jane Davidson, Welsh Assembly Minister for the Environment, Sustainability and Housing, heralded an addition of 3 more material collections – printer and toner cartridges, mobile phones and household batteries, and ash now being collected as part of the green waste collections. Following this, researched weights of the residual waste stream identified that a diversion figure of 77% has been achieved. This equates to every month St Arvans saving 43 trees and enough energy to light a bulb in every St Arvans house for 37 hours a month. Zero Waste Commitment Pledges were signed by residents and Community Councillors to show their support for the Zero Waste Initiative. In total St Arvans has collections of Paper, Glass, Cans, Foil, Textiles, Plastic Bottles, Rigid Food Grade Plastic, Cardboard Drinks Cartons, Printer Cartridges, Mobile Phones, Batteries, Food Waste, Cardboard and Green Waste. It is believed that more types of material are recycled in St Arvans than any other area of the UK. 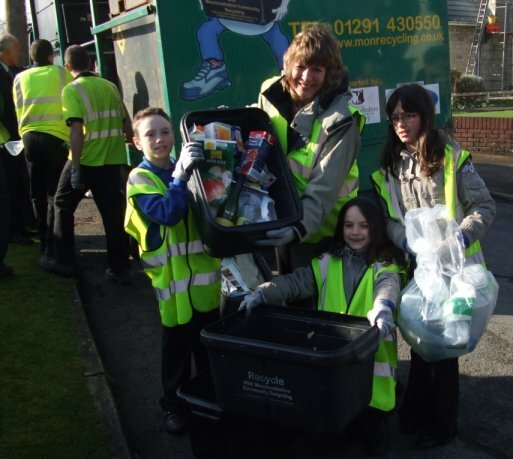 Having so many recyclates collected has encouraged residents to ‘shop sustainably’. This means residents only buy products that can be recycled / composted themselves, in packaging that can also be disposed of by the recycling or composting route. The Zero Waste Village Project has gone beyond St Arvans to tackle a less well performing area of Monmouthshire. The Communities First Area of Abergavenny began with a participation rate of 36% (compared with St Arvans starting rate of 85%). 36% was the lowest recorded participation rate of any area of Monmouthshire. With canvassing, public meetings, incentive schemes aimed at encouraging participation and recycling rates the 36% rate jumped to 69% (above county average). 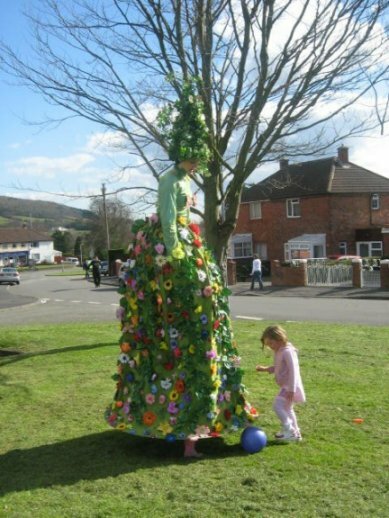 This phase of the project in Abergavenny was finished of with a recycling celebration to further raise awareness of waste management, the event included worm charming, re-use artwork, recycled prizes and a compost bin give-away. The compost bin give-away promotion asked residents to record the weights of materials put into their home-composters over a 5 week period. Results indicate nearly 1/3 tonne of waste a year is being diverted from each of the 100 participating households due to home composting. New recycling, reuse and waste reduction territory lies ahead. For St Arvans a plastic bag free initiative is being implemented in partnership with Transition Chepstow. In Abergavenny a ground-breaking reward shop initiative will see cans and plastic bottles returned to local newsagents in exchange for vouchers, helping to reduce litter. Both projects are supported by Keep Wales Tidy with funding from the Welsh Assembly Government. The success of this scheme is down to work on all levels by residents, project partners and collections crews.